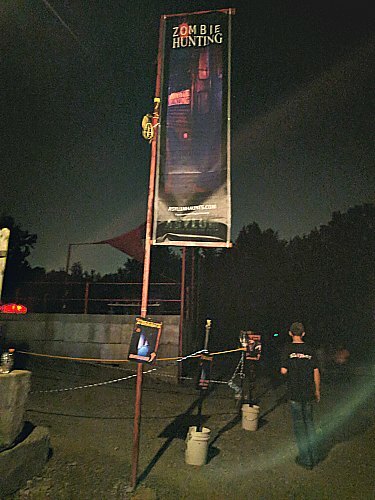 Asylum Haunted Scream Park is a Haunted Attraction located in Louisville, KY. Team Zombillies reviewed this attraction on September 22, 2017. 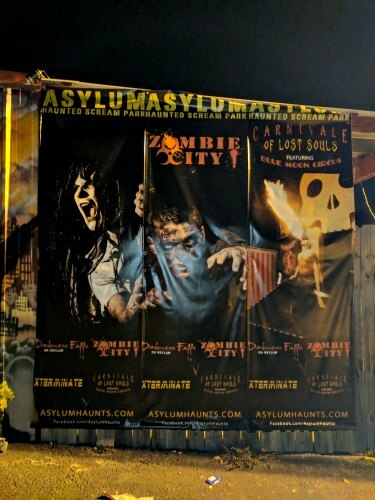 Asylum Haunted Scream Park takes place on 40+ acres of property where you can experience 2 separate haunted trails, a zombie paintball bus ride, an interactive laser tag mission on foot, some midway carnival entertainment and more! 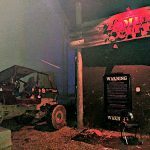 Zombie City is a haunted trail that is heavily-theatrical and one of the most interactive haunts we have experienced to date. This attraction takes making you “part of the action” to a whole new level as you try to make your way through the ruins of Blackwood City. You may have to eat things, hide from killers (literally) and run away from the living dead in an attempt to flee the exit… that is, without being bitten or shot! Darkness Falls on Asylum consists of “just under a mile walk through terror-filled woods.” This haunted trail will take you deep into the forest, where only your worst fears can hear you scream! Upon entering this dark and deadly path, be prepared to experience a collection of creatures and a forest filled with frights. Ever wanted to open fire on flesh-eating zombies that can’t shoot you back? Zombie Hunting will give you that chance! Here, you will board a specially-designed bus featuring UV paint-activating lights with a single and simple goal… shoot as many zombies and other objects as you can! If pursuing lively, mutant clowns on foot equipped with a rifle sounds like your kind of fun, then Exterminate Mutant Attack is where it’s at! Your mission is to find 3 hidden objects all while slaying as many mutant clowns as you can in the process. Are you up for the challenge? Will you succeed at finding the objects and shutting down the clownish chaos for good? Wait… is he still there?? 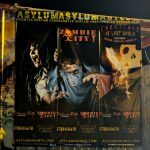 Zombie City is meant to be a highly-theatrical experience, rather than just doing your typical “boo” scares. Therefore, the characters here have a lot of very scripted dialogue, but they execute it very well and will also throw some improv in there too, when given the chance. It was obvious that the cast here knew what they were supposed to do and they did it very well! Most of them stayed in character long before and after we were in their scenes and they ended up being the most interactive and believable crew members we’ve seen so far this season! Even though he was thoroughly convinced that “tatties” would save us from the zambie apocalypse, our better judgement took over and we made good use of the rear emergency exit. Along the way, our tour guide saved our butts on multiple occasions, helped us shut down the town’s contaminated water supply and led us to the labs where we eventually found the exit. His role was key to our safety and escape, but our trip through Zombie City just wouldn’t have been complete without meeting the other civilians and lab workers, along with the delirious Dr. Riker and his assistant. It appeared that Riker has developed some strange, mind-synching abilities with his latest version of the Pandora virus and, we must say, you will NEED to witness it first-hand to get the full effect! If you’re feeling especially hospitable when you see him, you might even get to help him with the next step of his master plan! The actors within Darkness Falls were spread out along the trail pretty well and, at times, there was quite a bit of “dead space” between them. But, on the bright side, this encouraged us to let our guards down more often, which allowed several of them to catch us by surprise pretty easily! Several of them had very good characters to portray and those that did stayed in character more so than others, making them the most believable ones on this trail. These guys really separated themselves from the pack and had interactive and diverse dialogue. But, we also came across some who weren’t really into their roles at all, including one who told us he was disappointed that there weren’t more people in our group (he was still hiding, waiting for another victim as we walked passed him). When it comes to the characters that really stood out, we want to first mention that the guy who let us into Darkness Falls really set the mood for the whole haunt, mainly due to his deep, weathered-sounding voice and serious demeanor. The doctor we came across had one of the most maniacal laughs we have heard and the cook outside Hell’s diner was one of the most enthusiastic characters we stumbled upon. Uncle Rigamortus did a great job at explaining what was at the bottom of his hot shaft (in his boiler room, mind you) and the two clowns we came across were very entertaining, yet understandably un-trustable. One was named “Parasite” and we couldn’t get the other’s name… but you won’t miss him when you see him; he had a chicken head hanging out of his zipper. Granted, we do see clowns a lot, but these two were different… and downright disturbing! With this haunt taking a more realistic and theatrical approach, most of the costumes we came across inside Blackwood City were mostly what you’d expect to see in a freshly-apocalyptic world. Clothing on civilians varied, depending on if they were normal people (typical street clothes and minimal makeup/blood), Paragon employees (uniforms, chemical jumpsuits, etc. with some makeup) or those that have already fallen victim to the Pandora virus (worn, tattered clothing, rotting skin, more blood, etc.). Others were wearing character-specific pieces, such as a doctor’s lab coat, church robes, a bloody butcher’s apron, etc. Overall, each of the characters looked their parts and matched their scenes well, but weren’t what we’d call “hyper-realistic” or “over-the-top.” In this case, that’s a good thing because it made the whole experience much more believable and something we could relate to. The most memorable makeup we saw was worn by Dr. Riker, with his wild hair-do and glowing veins creeping just beneath his skin! This trail has a little bit more variety than Zombie City when it comes to their monsters. During your walk through the darkness, you’ll see everything from mad doctors and hellish hillbillies to bloodthirsty butchers and wicked witches! Most of the costumes were appropriate for the characters wearing them, with a few exceptions that seemed a bit odd, given their surroundings. Each were still able to pull off their looks without getting too excited in the costume or makeup rooms. A few used masks to help finish off their wardrobes, but none of them (the masks) seemed to be especially eye-catching, from what we could see. Some of the best stand-outs include the mad doctor, the masked witch, the butchers, Hepatitis Hogslaughter and the “lively” cemetery statue. If you’re travelling west on the freeway from I-65, this place is easy to spot from a distance if you glance to the right just a little ways before you get to the Stonestreet exit. The lights and giant white tent cut through the surrounding darkness with ease! As we neared our destination, we turned off the main highway and noticed a dimly-lit sign at the end of the driveway that leads to the Scream Park. Shortly after, we saw another one that confirmed we were at the right place. Asylum Haunted Scream Park shares the property with Paintball Asylum, so there’s plenty of free and well-lit parking available. Many new signs were added to the midway this season, including an entrance archway that you will walk beneath. The new signs made it much easier to navigate the park and get into the correct waiting lines. A green screen photo op was set up where you can get your pictures taken and pick them up before you leave (for an additional fee, if not included with your ticket). Speaking of tickets, the booth was very easy to spot, being as it was decorated with its own blocky, rock facade and plenty of portable restrooms are adjacent to it for your convenience (The blue one was the cleanest… pick that one, if it’s available). The Carnivale of Lost souls offers live performances on most nights for crowd entertainment while waiting to enter the haunts. During our visit, there were multiple queue line entertainers roaming about and giving customers a scream to help pass their wait in line. They also have a Scare Bus for you to try out, which is one of the only portable haunted houses we have come across in the area! During our visit, there was also a vendor selling creepy jewelry and accessories, an ice cream truck (a real one, with real ice cream, that wasn’t snatching up children and stuffing them in the freezer… though, it still looked creepy enough), a BBQ stand (that we highly recommend a pulled pork sandwich from) and a haunt memorabilia booth with tank tops, t-shirts, hoodies, snacks, drinks and more! 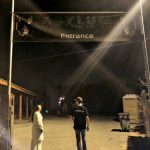 Asylum also offers a couple of side attractions, named “Zombie Hunting” and “Xterminate: Mutant Attack.” Zombie Hunting pairs you with paintball guns aboard a customized bus that’s made for slaying the undead. We could tell that a lot of them were out there because of the rancid smell of decaying flesh that we smelled as we made our way to the bus (as it turns out, there were only a couple of zombies left out there by the time we made it through the other haunts). Xterminate, similarly, arms you with laser tag weaponry and tasks you with mutilating the mutant clowns as they attempt to keep you from neutralizing them! This one was a lot of fun and has its ways of bringing out the “Call of Duty” in everyone who participates. 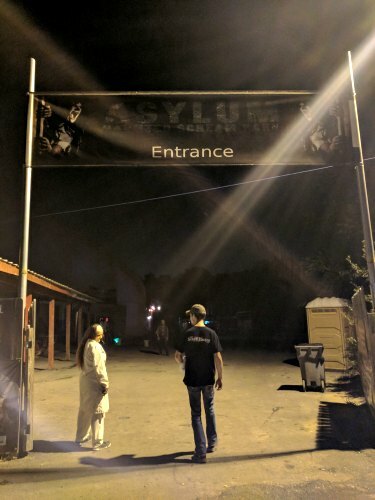 Each of Asylum’s two main haunts take place outdoors, so you will want to come prepared to walk through the woods and mud. Be sure to use caution in these areas, as we did come across some ramps, rogue tree roots and some occasional uneven ground. Friendly staff were found inside the ticket booth and at the entrance of each attraction, should you have any questions. When we first arrived, one of the first things we could hear were the sounds of a chainsaw off in the distance. Although there wasn’t a crowd during our visit, loud, fast-paced music filled the air from inside the massive white tent that Xterminate takes place in and the decor outside the attractions gave us something to focus on before entering. 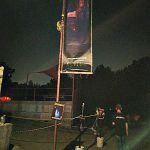 Many haunt signs, banners, a “relieving” surprise near the restrooms and multiple roaming line actors helped set the mood to enter a haunted house. We witnessed the queue entertainers doing a great job at scaring guests before they entered! The overall atmosphere is fun and inviting, but once we made our way to the entrance of Darkness Falls, ambient music and lighting took the atmosphere to a much spookier place. 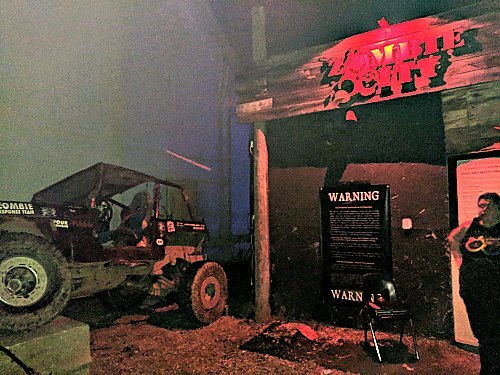 The entrance to Zombie City had some appropriate decor, including a Jeep decked out for the zombie apocalypse, a tall watch tower and some chain link fencing that gets used on busier nights, but there was nothing else going on before we entered during our visit. The special effects within Blackwood City are meant to create the type of experience you’d get from walking through portions of a run-down city. The naturally eerie appearance of the trees and swampy areas at night time even made us wonder if they had anything to do with how “Blackwood City” got its name. You will also see the fronts of buildings, disabled vehicles, the inner workings of the town’s sewer system and multiple other buildings… each housing something different within. There were also some nifty gadgets in use, including a door locking mechanism, an auto-moving door, multiple monitors and a few interactive control panels. For the most part, the city is pretty dark and a few candles may be the only thing allowing you to see what is going on around you. Be sure to step away from any piles of bodies you may come across. They belong to those who didn’t make it through the virus epidemic, so… you never know… they may spring back to life at a moment’s notice! Even though we didn’t notice any sound tracks or music playing, a selection of sounds can be heard at key moments throughout the haunt. For instance, a loud and sudden blast (also a hot one), many gunshots, screams, warnings and groans from oncoming, awakened dead people penetrated the silence with their own, authentic touches. Darkness Falls consisted of quite the variety of effects, both large and small. Some of the areas are very detailed, including Shanty Town, the wasteland area, Hell’s Diner and the cemetery. Only what seemed to be the natural sounds of the woods were mostly all that was heard between scenes. However, there were some areas where we could hear some louder hard rock tracks, horses bellowing and some quieter, downright utterly-creepy music. Many of the effects here have been made in-house so you may not see others like them elsewhere. Additional effects that we came across include an intercom, moving floors, a tilting cabinet, a vintage skeleton projection, an ice cream truck, a plummet into some hot coals, a chilling church scene and a passageway through a walk-in freezer! There are so many other things we could mention here, but you’ll have to see them for yourself because we don’t want to give them all away. Zombie City is a highly-theatrical attraction that follows the theme of Blackwood City and the influence of Paragon Technologies in it. This year is no different and the plot continues to thicken as Dr. Riker desperately strives to develop a cure for the Pandora virus. To sum things up for first-time visitors, Paragon is the corporation responsible for creating the Pandora virus in an attempt to cure mad cow disease. Instead, (to quote our previous review) the virus causes “irritable and cannibalistic behavior in those who become infected with it” and it was accidentally released in Blackwood City years ago. Their efforts to clean up the mess have resulted in shameless genocide and mass executions, thus rendering the city to a post-apocalyptic state. “But why,” you may ask? “Why has our valiant Dr. Riker switched sides on us?” That… is something we can’t ruin in this review. BUT… we can assure you, that the good Doctor definitely has a bad side and you DON’T want to miss his twist on the story this year! The cast’s performance in Zombie City has shown a marked improvement over last year and each of them were excellent at working with one another to bring this unique experience to life! We always look forward to returning each season to see how the story has progressed and we’ve yet to find another haunt quite like this. It’s not the scariest haunt around, but their ability to draw you into this movie-like experience is second to none and they still manage to give us a few good jumps every year! Darkness Falls on Asylum doesn’t follow one solid theme. Instead they offer many different themed areas so you can expect to see a large variety of creatures, decor, madmen, fears and their own custom creations. From clowns, butchers, a sadistic doctor, witches and a wasteland where they are using human parts for all their spare car parts, there’s something to whet the appetite of most haunt goers here. One would think, as you enter this dilapidated city, that the zombies are the main thing you should stay away from. We quickly found out that this wasn’t the case! Mostly all of the people we came across seemed to be far more dangerous than the living dead. There were some effective startles delivered along our route (mostly resulting from distractions) and some of the fright effect techniques consisted of creating a sense of urgency, the unknown and bewilderment. They will also try to take you out of your comfort zone by making you run from zombies, hide from a deadly killer and eat something in return for an item you’ll need to proceed. On multiple occasions, we were left to defend for ourselves amongst the madmen and zombies alone. It’s crazy how one would think your guide is just an extra person walking along with you… that is, until they’re gone and you’re left to fend for yourselves! At the end of the attraction, we fled from the lab as ravaged zombies ripped the last remaining normal human in the city to shreds. A wider variety of fright techniques were encountered along this winding trail. Although our group only consisted of two people, we feel that some of the fright techniques were so unpredictable that they would have caught a larger group off-guard as well, particularly the ones that were in between the main scenes. At one point in time, we noticed some things that appeared to be completely moving on their own (which really had us puzzled). We also came across some tight spaces, several common fears, loud and sudden noises and sneaky hiding spots. They also split our group up and threw several distractions at us to keep us on edge. We were ready to hightail it out of there on multiple instances, especially when one taller actor was following us and, every time we turned around to watch him, he was walking towards us faster and faster! We don’t want to give everything away, but at the finale of the attraction, our group made a mad dash for the exit to play along and, just when we thought things would get quiet, we were quickly proven wrong! There are multiple ticketing options to choose from at AHSP. With each ticket purchase, guests will also receive access to the Carnivale of Lost Souls. For those who just want to go to be scared, “Scare Pass” admission is priced at $28.00 per person and includes Zombie City, Darkness Falls and Xterminate. If you want to go and just do one attraction, separate tickets are available for $20.00 each. For those who want to go all in, an “All Access Pass” is priced at $40.00 and will grant you admission to all 5 attractions. They also have a “VIP” ticketing option for those really busy nights, thus allowing customers to skip the general admission lines. Those can be purchased for an additional $20.00 on top of the “Scare” or “All Access” passes. It took our group about 22 minutes to escape Blackwood City and another 23 minutes to find our way out of Darkness Falls. For just the two haunts, that’s a combined 45 minutes of fearsome entertainment! Since the All Access ticket option is the cheapest way to visit all 5 attractions (which is what we recommend, unless you are in a dire hurry), that option brings them to 1.13 minutes of entertainment received per dollar spent (MPD). Although that amount of time is just below the 1.5 average that we see most often, this ticket option increases this value significantly. Don’t forget that this is also the home of the Slenderman: Live Action Experience! They will be hosting this one-of-a-kind event on Thursday nights in October this season. To read our review of Slenderman, click HERE.